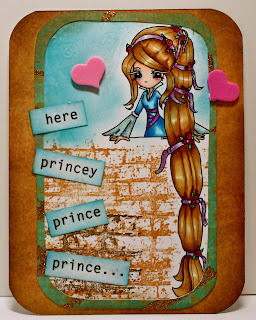 Strawberry Road: here princey prince prince...with Tiddly Ink's! Oh dear. What do we have here? Another beautiful woman with extraordinarily long hair, leaning over the walls of her castle, waiting patiently for her prince. Did he get lost? Maybe he knocked on the wrong gate? Maybe he should stop and ask for directions? Or maybe his horse went wild and he's stuck in a ditch somewhere. Or maybe he's just not ready for a woman of her caliber. Who knows! Well boys, if any of you happen to find your way to my blog :) :) :) Hi. Um....welcome! Look up once in a while. You might be surprised who is looking back. It just might be Rapunzel. Now onto the Crafty Challenge! This week, Tiddly Ink's challenges us to create a card with the theme "Kiss Me, You Fool" using your Tiddly Ink's Digis which you may explore here. To visit the Tiddly Ink's Challenge Blog, go here. Thank You for your stopping by! I hope you found something you liked!!! And remember to LOOK UP once in a while and SMILE! I love this! I agree with Lou this is hilarious! 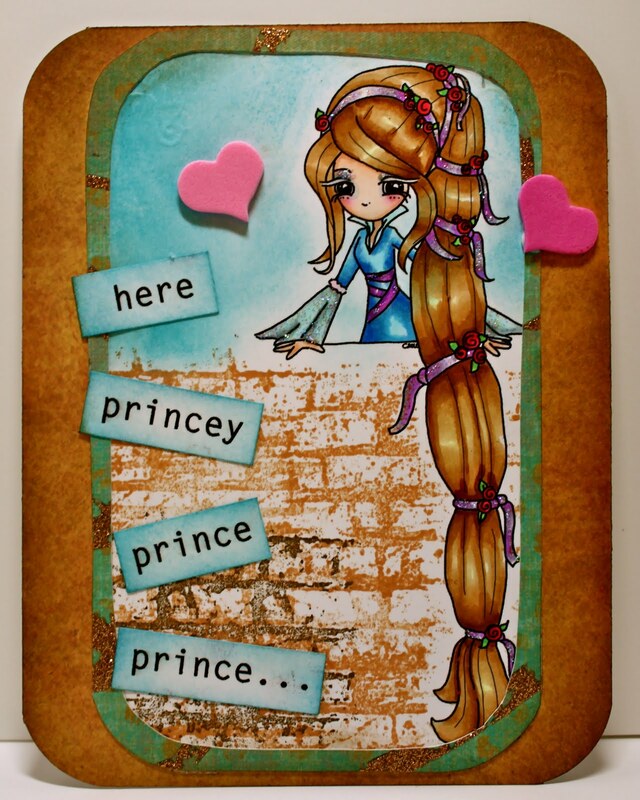 Love it and the look on the Tiddly Rapunzel is just perfect for the sentiment! This is just GORGEOUS Portia!!! I am always in awe of your stunning color combinations!! This is so gorgeous, Portia!! Your coloring totally ROCK, LOVE your card!! Very funny and prett Portia! Love that sentiment and the colouring of the hair is fabulous!